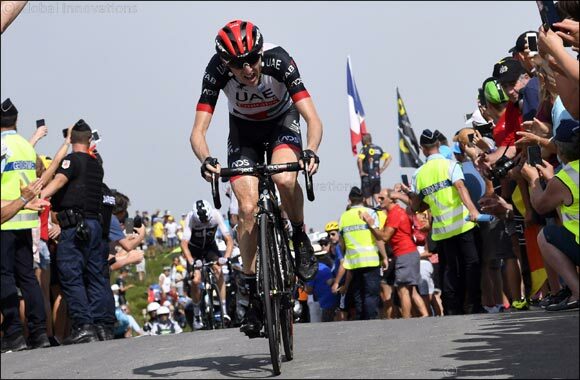 Dubai, UAE, August 01, 2018: UAE Team Emirates’ Dan Martin is wasting little time getting back onto his bike following a successful Tour de France, as he pulls on the team’s jersey this weekend for the Clasica de San Sebastián (4 August). Martin, who picked up a top 10 General Classification (GC) finish and the award for the most combative rider at the Tour following his impressive attacking performances, will look to capitalise on his good form and become the first Irishman to win the one day race. Joining Martin in the Basque Country will be team mates Kristijan Durasek, Diego Ulissi, Alexandr Riabushenko, Manuele Mori, Jan Polanc and newly crowned Norwegian National Champion, Vegard Stake Laengen. The riders will be guided by highly experienced Spaniard, Matxin Joxean Fernandez, who has unprecedented knowledge of the region. Commenting ahead of the race, Maxtin said: “For lots of riders the Clasica San Sebastián is an opportunity to take advantage of the physical conditioning they’ve built up during the Tour de France. Our line-up will include two riders who have recently raced in the Grande Boucle; Daniel Martin, who was outstanding and always combative in France, and Kristijan Durasek, who is also very consistent on French climbs. Dating back to 1981 and in its 38th edition, the mountainous 229km classic is a favourite amongst the climbers. The 2018 route is similar to that of last year’s, with eight categorised climbs featuring across the day, with the brutal Iturburu, Jaizkibel and Arrate challenging riders to over 22kms of hard climbing. The race could be defined by who emerges at the summit of the final climb, the Murgil Tontorra, first, but they will have to manage their technical descent into San Sebastián if they are to take home the win.